The good folk over at Fantasy Flight Games have sent us a new spoiler for the upcoming Children of the Empire set. 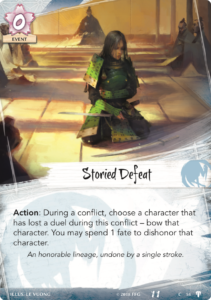 Storied Defeat is a card that adds some extra punch to duels, opening up new mind game options. Most obviously it synergizes well with duels that do not bow the opponent already, such as Policy Debate or most of the Challenger characters. I can see this working particularly well with Kakita Yuri in the upcoming Masters of the Court pack who has a duel that may not always be effective by itself depending on when he sees play. Additionally, this card can add weight to any duel in which the opponent gets to choose the character they want to participate since they may not to risk getting bowed. Like Insult to Injury, Storied Defeat can also dishonor a target that has lost a duel, though this card requires far less setup. 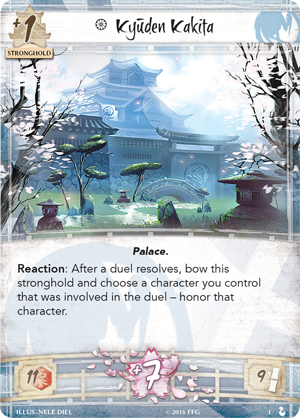 When combined with honoring effects like Courtly Challenger and the upcoming Kyuden Kakita, any duel you win can set up a potential Noble Sacrifice! For those interested splashing Scorpion, setting up I Can Swim and Bayushi Collector can become much easier. From a Crane perspective I like this card. This is the card Insult to Injury wishes it was. 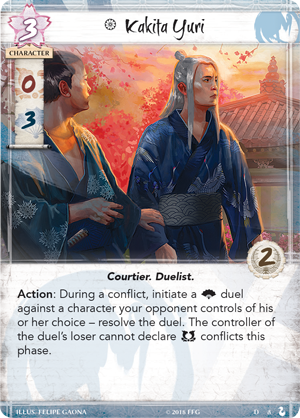 I think we still need to see more Dynasty side duels (I’d rather not spend 2 Conflict cards if I can avoid it) that do not inherently bow before we can give this serious consideration, but in a heavy duel focused deck i think it can open up some plays. That said, I must remind everyone: Dueling is not a win condition. Do not play this unless you intend for it to synergize with several cards in your deck.